Face Makeup- Are you craving for a new look? 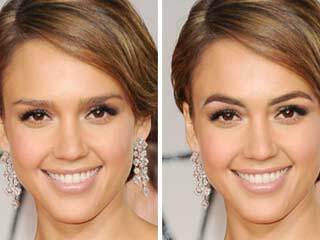 If yes then here are some really cool makeup tricks to make you feel like a new woman. Find out some easy makeup ideas for face to create a gorgeous look. Get to know about latest style options, ways to enhance your brows, which blusher to choose, how to do the correct eye make-up and even pick out a new hairstyle that will suit your personality. Make-up is our first cue to hiding our imperfections and the best way we can do it is by learning the fundamentals of applying and blending. Baby powder is commonly known to be used only for babies. There are many more uses of baby powder for beauty that you have never heard off. Eczema, also known as dermatitis is actually a condition of skin where skin is inflamed with dry and flaky patches. 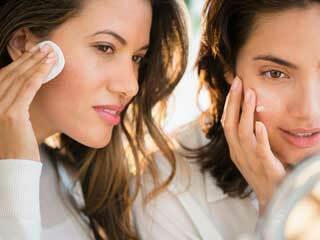 you can always hide eczema with a few makeup tricks. 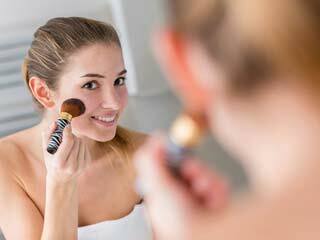 Read on to find out how to fake a fresh make-up to look flawless while keeping it subtle. Natural make-up look is always in style and ultimately wearable. For your ease, we also have a step-by-step video tutorial too. Makeup is a powerful tool to make your face look slimmer. Try some tricks mentioned here and watch the magic happen. Looking fresh all the time could be a task during summers. Your face needs hydration to fight the heat. Here is how you can do it. Who would want to waste money and time on expensive skin care products when the same effects can be achieved by applying ice on your skin? Yes, an ice facial therapy is all you need to get that clear, glowing skin. What you consume is as important as what you put on your face, when it comes to skin. After all the makeup and rough day, the skin needs to breathe. Help it. We want good skin but do not really take good care of it, most times taking wrong steps causing the quality of our skin to degrade. Know what goes wrong.